This is bánh cam or bánh rán aka “sesame balls” to non-Vietnamese, non-Chinese speakers. This dessert-y snack is fried dough with a starchy filling. In Vietnam, that’s typically a mung bean and coconut filling. In China, they are filled with red bean paste, lotus paste, or sweet black sesame paste. In both countries, sometimes the dough is filled with a meat mixture, which goes back to what I mentioned earlier about how Asians have a tendency to blur the line between sweet desserts and savory foods in the peppery sweet potato waffles recipe post. I’m only barely literate when it comes to the Vietnamese language. Written words get filtered through to my brain like this: My feelings [don’t know that word] [don’t know that word] sky [don’t know that word] sadness rains yesterday [don’t know that word] until tomorrow there is sunshine. It’s enough to get the gist of what’s going on, but nowhere near enough to understand nuances. It’s somewhat difficult then, to figure out how to make Vietnamese food compared to American food because while there are tons and tons of English-language resources on pies, there are only a handful of English-language resources on Vietnamese sesame balls. Some of the opinions conflict with one another, and because I have such personal ties with Vietnamese food, any ol’ recipe just won’t do. It’s usually something extremely specific I’m aiming at. I remember being 10 years old or so. We lived 30 minutes away from Seattle. In the late 80s and early 90s, there was only one place for immigrants to get Asian ingredients and that was Little Saigon. So my parents would cart my siblings and me to Seattle. My dad would parallel park facing upwards on a hill. Back then, we didn’t have to pay for parking in that area. It was packed on the weekends, when we went. We went to about five different grocery stores in Little Saigon. My mom compared prices and would work like a ninja to spend the least amount of money on groceries. She’d also fixate over produce, picking through piles of fruit alongside other Vietnamese women. It wasn’t until much later that I realized that it wasn’t completely common, to jump from market to market. More Americanized Americans tend to go to one-stop shops and get all their groceries there. But my parents probably internalized a Vietnamese habit. When I was in Vietnam last year, I noticed how close together food, meat, and produce stalls were in cities and towns. Vietnam has a serious food culture. People’s lives revolve around food rituals. It completely made sense, to buy different ingredients at different places. Anyway, during our weekend outings, in one of the stores, there was a series of barrels. One had salted duck eggs. Another had thousand year old eggs. The third, weirdly enough, had huge sesame balls. I’d ask for those. My parents would buy one for me. I honestly don’t think it tasted all that good. It wasn’t warm. The dough walls were thick and overly chewy. But I feel sentimental about those balls because when I shook them, the mung bean filling rattled. I kept asking for those balls based on the fun factor alone. So that’s the recipe I’m in search of. Have been for years. The recipe below isn’t it. What a build-up to a recipe that isn’t it, right? I figure that the best way for me to figure out the recipe is through process of elimination. This recipe below was made completely with glutinous rice flour and boiling water. It resulted in a very tender, sticky, and chewy dumpling—the texture and consistency of mochi. It’s totally pleasant and yummy and crispy. But, of course, nothing would rattle in it because it’s not hollow enough. I filled these with banana simply because it was what I had on hand. It adds a nice sweetness that isn’t cloying. This recipe isn't fussy enough that you need to weigh ingredients so I included volume measurements. Also, it's very important to use glutinous rice flour, not regular rice flour. Cool water in a small shallow bowl, for dipping. Stir first portion of sugar (50 grams), flour, and salt in a bowl to make a homogeneous mixture. Toss banana chunks in the cinnamon and other portion of sugar. Pour sesame seeds into a shallow plate (you'll be rolling the rice balls in them.). Set the plate and your bowl of water to the side. Dust your hands with a little flour. Form dough balls by pinching off pieces the side of a gumball. Roll into a ball. Then, flatten the ball into a disc with your fingers, about ¼-inch thick. Hold the disc in your hand. Spoon in a few banana chunks (about 2-3) into the middle of the disc with your other hand. Then, with your fingers, gather the edges of the disc and gather them over the filling, pinching to close the top and form a ball. Your ball will be a little misshapen. Dip your dough ball in water (it was dissolve much at all, don't worry). Then drop the ball in the plate of sesame seeds and roll around, coating the ball with sesame seeds and smoothing the ball into more of a round shape. Heat oil up in a wok or deep fryer to 375 degrees. Fry no more than 5 balls at a time, rolling them over in the oil a few times with a spoon/spatula/chopsticks. They will float. They will also puff a little and become rounder. Carefully scoop the balls out when they are golden brown, about 3 minutes. Repeat with the rest of the balls. These are best eaten when they're fresh. They will deflate a little and lose their crispness when they sit out for a while. But! You can also easily refresh them in the oven at 375 degrees for a few minutes. In an earlier version of this recipe, I forgot to make the distinction between rice flour and glutinous rice flour. It’s very important to use glutinous rice flour. Glutinous rice flour doesn’t have any gluten in it. It’s named like that because it has a high amount of starch that, when cooked, binds together and lends a chewy elasticity. Rice flour, on the other hand, creates a more tender final product that snaps underneath your teeth, rather than stretches. Rice flour is more like pasta or a thick custard and is, in fact, the flour used to make rice noodles. 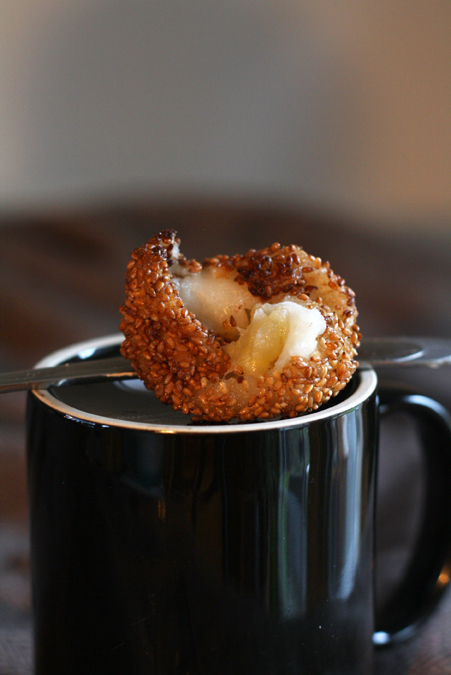 Genius to stuff them with bananas. I wasn’t expecting that as you know, all the recipes out on the Internets are for the ones stuffed with mung beans (which, I do love, but come now, where are the coconut filled ones?!?) You had me laughing with your build up on the perfect sesame balls…and how this recipe is not it. Hahaha! Love the illustration of the anatomy of the balls. Such a clever site! What if you have a picky eater that doesnt like the pastw or bananas. What other sweet fillinf can u put inside of these? Thanks in advance. Just stumbled onto your site and have been here for about 2 hours now…. You’ve been tagged with the Beautiful Blogger Award! S, I LOVE all your food posts so far! I eat/would eat all this food. The photos are great, but I especially love the infographics!!!!! And this layout redesign! The illustrations are awesome! I think you definitely captured the beautiful/ugly reality of food. Really love the landscape of the knife and the cleaver and carrot and salt shaker. Can’t get enough of this layout. If you and Betty ever visit Taiwan, we will eat like crazy. Um, we are definitely visiting Taiwan. It’s only a matter of when. Thanks for the nice words, Lee! You’re so sweet. We are definitely of like minds when it comes to food!